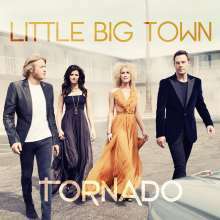 Der Artikel Little Big Town: Tornado wurde in den Warenkorb gelegt. "I am so excited for people to hear this new record,” said Jimi Westbrook. “We worked with Jay Joyce and he really pushed us to be in the moment. There was such an amazing energy between all of us in the studio and I think you can feel it." The album’s lead single “Pontoon” was released to radio in April and is currently Top 15 on Billboard’s country radio chart. This has been Little Big Town’s fasting rising single to date. “Pontoon” is #1 on the Soundscan Digital Country chart for the second week in a row and has sold over 520, 000 tracks in only eight weeks. The official music video has been viewed over 1.7 million times.